Electronic tuner - Needed to help you tune your guitar, as it will go out of tune quite often. There are several reasons for this: changes in temperature and humidity, pressure on the strings, accidentally knocking the tuning pegs... It's good to make a habit of checking it is in tune before each time you play. There's nothing more discouraging than playing an out-of-tune guitar! Electronic metronome for keeping time - or, you could get an electronic tuner/metronome combined and save money - for example, the Boss TU80 or Korg TM-40. Also, some smart phone apps, such as Guitar Toolkit, combine a metronome and a tuner and these seem as good as the stand-alone tuner/metronomes. I advise against getting an old-fashioned wind-up, tick-tock-style metronome - They make a more natural sound, but they have less features and are less useful. The photo above shows two clip-on tuners and a tuner/metronome combined (a Korg TM-40). The clip-on tuners attach directly to the headstock of the guitar. 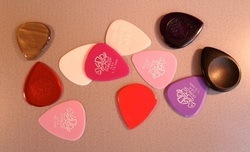 It's a good idea to get several picks of different thicknesses to try out. Thin ones, .35mm to .50mm, are good for strumming when you first start playing. They have a lot of flexibility and give you an even sound. Thicker picks, e.g. above 1mm, are good for playing single notes - the thin ones sound a bit weedy when used for this. These will save you running to the store in the case that you break a string, which happens occasionally. You'll need to replace them all after a few months anyway, as they get old and discoloured, lose their bright sound and start to play out-of-tune in certain places (this is due to imperfections developing along the strings caused by repeatedly being pressed against the metal frets). 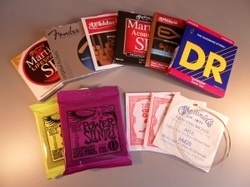 Regular strings for an electric guitar are 9's, and for an acoustic, 12's. Beginners with an acoustic guitar sometimes start out with 11's which are easier on the fingers. The numbers refer to the width of the thinnest string in the pack. If you go to a guitar store and ask for "a pack of 9's for electric guitar", for example, the store person will know what you mean. Needed to make notes during lessons. Download a free TAB template to print off. A padded gigbag or hard-case - to protect your guitar if you take it out of the house. A stand - Leaning a guitar against the wall will eventually warp the neck, and if you rest it on the floor you could step on it. If you have a hard case you don't really need a stand, although a stand does make your guitar accessible, easier to pick up and practice. A capo - needed to play certain songs in the same key as the original, and essential if you plan to sing while accompanying yourself on the guitar. A strap - if you want to play standing up or make the guitar more stable when sitting down. A video camera or audio recording device - eg on a mobile phone or a camera. Very useful to record some exercises during the lessons so that you can listen back to them when practicing at home. It's easy to forget new rhythms and strumming patterns.